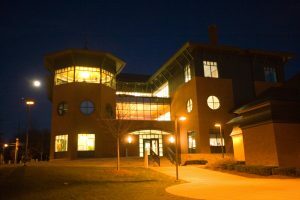 The Robert E. and Holly D. Miller Information Commons opened on April 30, 1998, following more than a decade of planning and approximately eighteen months of construction. MIC is named in honor of Robert and Holly Miller, whose generosity made the building a reality. Designed in keeping with a new approach to college and university libraries as “information commons,” or hubs for academic services, Miller Information Commons accommodated a vastly expanded library housing both traditional print resources and emerging electronic resources, along with study spaces, classrooms, computer labs, faculty offices and a suite of multimedia editing labs. 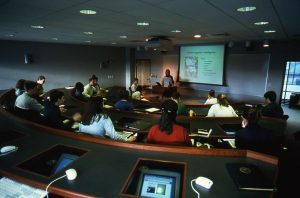 One of the classrooms was equipped with state-of-the-art video conferencing technology for Champlain College’s first venture into online instruction, SuccessNet, then only a few years old. 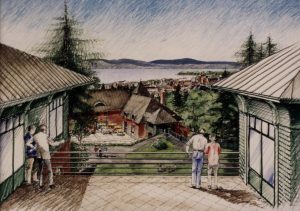 Architect Tom Cullins’ award-winning concept utilized a Victorian design vocabulary to meld the structure with its historic neighborhood and capitalized on a spectacular view of Lake Champlain and the Adirondacks, features that we treasure every day. 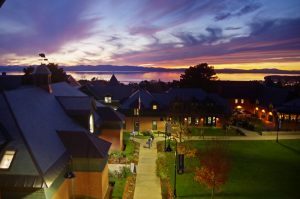 Today MIC remains one of Champlain’s crown jewels. Its stunning design, exceptional views, and inviting academic spaces render it as fresh and relevant in 2018 as it was in 1998. This month we are celebrating the 20th anniversary of Miller Information Commons with a special exhibition and related programming. Join us for a special birthday treat on April 30!